Location: Dumfries and Galloway, Scotland. Ownership / Access: Duke of Buccleuch. 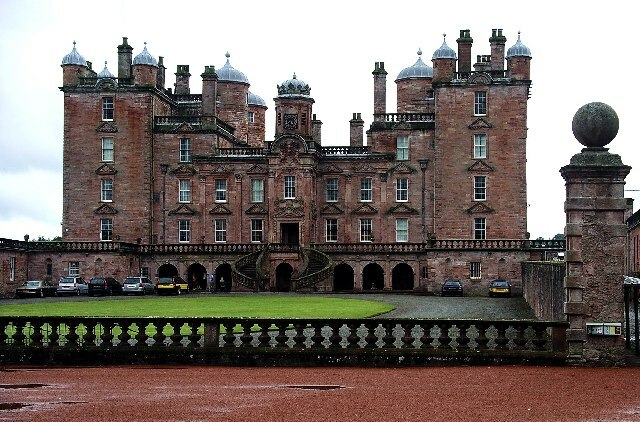 Notes: Drumlanrig Castle is situated on the Queensberry Estate in Dumfries and Galloway, Scotland. The category A listed castle is the Dumfriesshire home of the Duke and Duchess of Buccleuch and Queensberry.The castle is home to part of the Buccleuch art collection which includes Rembrandt's An Old Woman Reading, and Leonardo da Vinci's Madonna of the Yarnwinder which was stolen in 2003 and returned in 2007 after being found in Glasgow and many other paintings, tapestries and objects of art. The stableyard houses the Stableyard Studios and cafe.